The Automatic Compactor eliminates the laborious process of manual compaction and an even degree of compaction is achieved. The driven mechanism lifts the weight of 4.5kg and drops it through a correct height of 457 mm. The rammer foot is removable, which facilitates preheating. 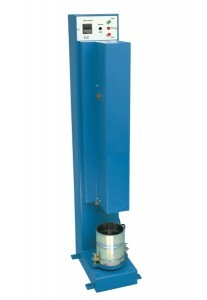 A compaction pedestal with specimen holder is fixed to the base. An Automatic Blow counter enables the number of blows to be present before each test and automatically stops the machine on completion. Suitable for operation on 230 V, 50 Hz, Single Phase, A.C. supply.